This peanut butter graham cracker pie crust recipe kicks traditional no-bake pie crusts using graham crackers up a notch. This filling is a perfect base for cold fillings such as pudding and ice cream, especially those using chocolate like chocolate cheesecake. Generously butter a 9-inch pie plate or tin. In a large bowl, whisk together graham cracker crumbs and sugar. Blend in peanut butter until thoroughly combined. Add water, 1 tablespoon at a time, and knead with your hands until mixture sticks together. Press mixture evenly into the bottom and up the sides of the buttered pie plate. Chill pie crust about 2 hours until set, then add filling. This pie crust is great for fillings such as pudding and ice cream, especially those using chocolate. Girl Scout Cookie Chocolate Peanut Butter Pie Recipe: If you don't have the Tagalongs Peanut Butter Patties Girl Scout cookies to make the crust called for in this pie, use the peanut butter graham cracker crust recipe. 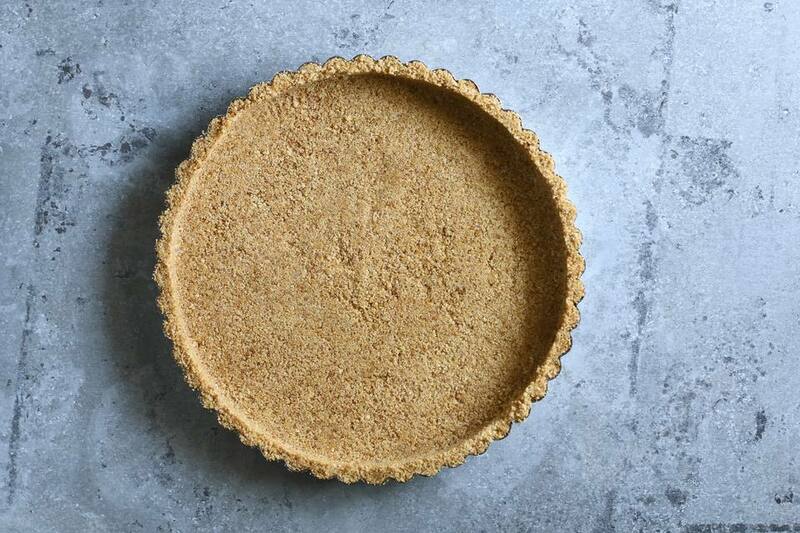 Easy Chocolate Pie Recipe: This recipe calls for a chocolate cookie crumb crust but this filling is just made for the peanut butter graham cracker crust featured here. Chocolate Peanut Butter Crunch Bars Recipe: This multilayered treat has a little bit of everything—a crispy chocolate base, peanut butter fudge, chocolate peanut fudge, and a chocolate icing on top. Peanut Butter Bundt Cake with Chocolate Icing Recipe: This rich cake is packed with peanut butter and drenched in fudge icing. Chocolate Peanut Butter Recipe: This easy-to-make gourmet chocolate peanut butter is perfect as an edible gift. Put it in a fancy jar and slip it into a basket for bake sales or fundraisers. It has a slight coffee flavor elevating it to adult fare.